Our Organic Cacao Powder is sourced from Peru, where the raw cacao beans are slowly fermented to bring out their rich flavor and then sun-dried, instead of roasted, to retain all of their valuable nutrients. Our cacao is harvested under a fair trade program that promotes environmental sustainability and fosters strong ties within the local farming community. 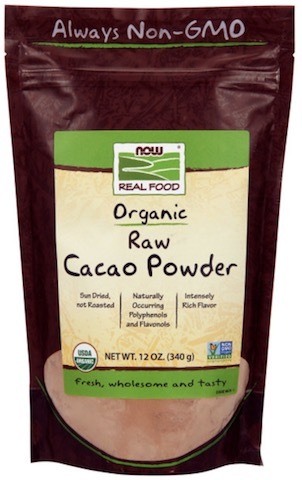 With NOW Real Food® Organic Raw Cacao Powder you can enjoy the intensely rich flavor and nutritional benefits of dark chocolate without added sugar and unhealthy ingredients. Cacao powder is ideal for wholesome, natural recipes, and it’s a great addition to a variety of desserts and beverages, including hot chocolate and ice cream. Raw cacao has naturally occurring polyphenols and flavonols, making it a true superfood! Directions: Cacao powder is ideal for wholesome, natural recipes, and it’s a great addition to a variety of desserts and beverages, including hot chocolate and ice cream.